So, I was more than happy to be invited by Burrp and Food Bloggers Association of India (FBAI) for a blogger’s meet at my favourite restaurant. 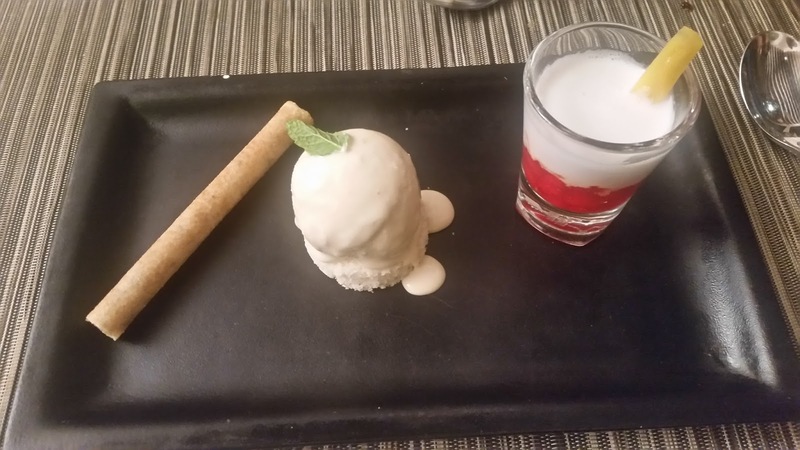 Burrp, the restaurant review portal has been quiet in Hyderabad for some time, so it was good to see them bounce back with some new initiatives and a new mobile app and logo. FBAI, the active pan-India association of food bloggers, has quite a few members in Hyderabad and the meet gave them an opportunity to come together. The meeting started with a brief address by Mr. Akesh the Senior General Manager of Marigold followed by a short presentation by Burrp. Soon we were ready for the main event – the tasting session of some delicious food. Chef Taraknath who heads Mekong had planned a special menu for the occasion. The menu had a huge spread of around 20 dishes. 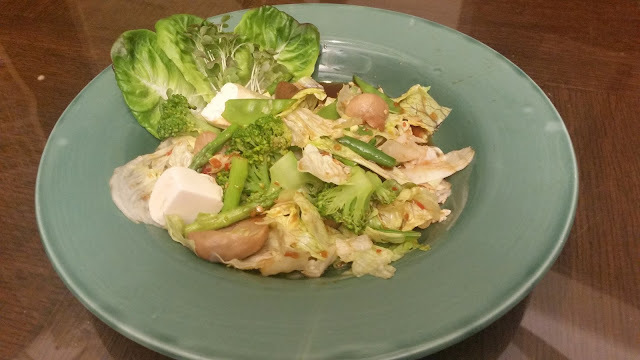 First in was a Thai tofu salad called Yam Taohu, which had tofu, green leafy vegetables and mushrooms in a chilly jaggery dressing. I am not a huge fan of tofu, but liked the sweet and sour taste of the salad. 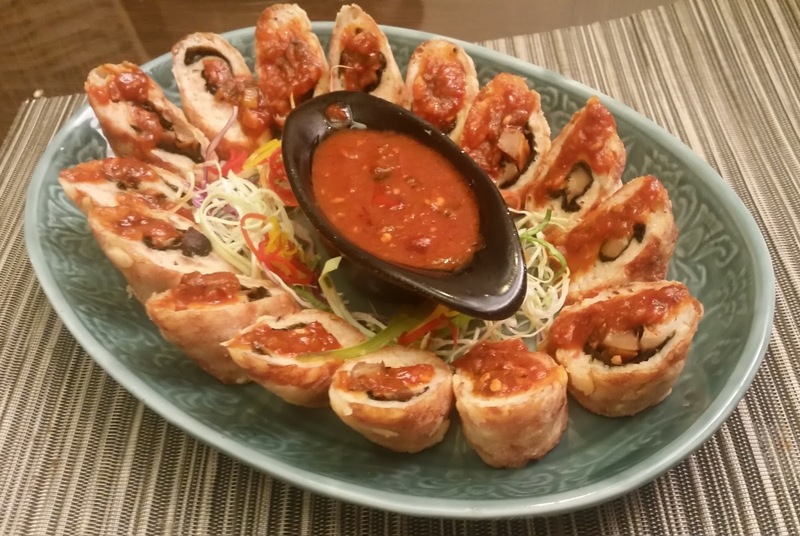 Mekong is known for its range of sushis and the menu for the day had two variants. 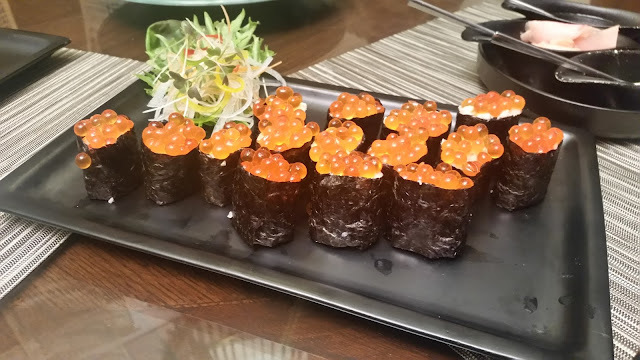 Ikura Gunkan Maki had rice rolled in a cap styled look with orange salmon roe on top. The presentation of the dish looked adorable and it went well with the wasabi and the gari ginger slices. Oshinko Maki was a vegetarian traditional sushi with pickled radish and bell pepper in it. Among the starters my favourite was the Hanoi Toi Tom or Vietnamese garlic prawns tossed in a spicy sauce. The prawns were cooked just right, and had drawn in the garlic based marinade well. I could not resist from going for a refill of this delicious dish. Ngoh Hiang was a sliced up fried roll stuffed with spiced chicken and prawn mince. The chilli based dip served with it enhanced the taste of this starter. For the vegetarians, both the starters were crispy fried, Xiang Su Xianggu had shitake mushrooms whereas the difficult to pronounce Thxd Krxb Saybaw had lotus stems tossed in sweet chilli sauce. Dimsums in Mekong are quite popular. Here I liked the vegetarian Jiaozi shaped dimsums which had bok choy and spinach. The Hargow was crunchy with the water chestnut in it, the shrimp taste was not that prominent. The famed Myanmar delicacy Khow Suey was served next. The broth mainly consisting of chicken and coconut cream was quite decent, but I have had so many different versions of this at various places that I am no judge of authenticity. What I missed here were the add-on condiments served separately with the Khow Suey, so that you can customize your own dish. There were five main courses chosen by the chef. 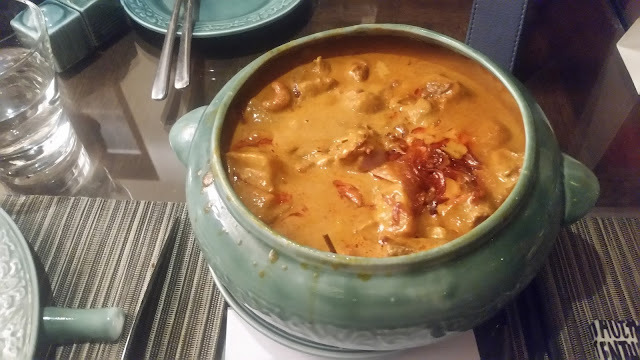 The Thai Massaman Curry, an example of Thai Muslim cuisine was what worked best in combination with Jasmine Khew Pela or steamed jasmine rice. The lamb dish was quite different from the normal Thai curries due to the use of different set of spices and the potatoes soaked in gravy. Curried Crab Singapore Style scored with its presentation. 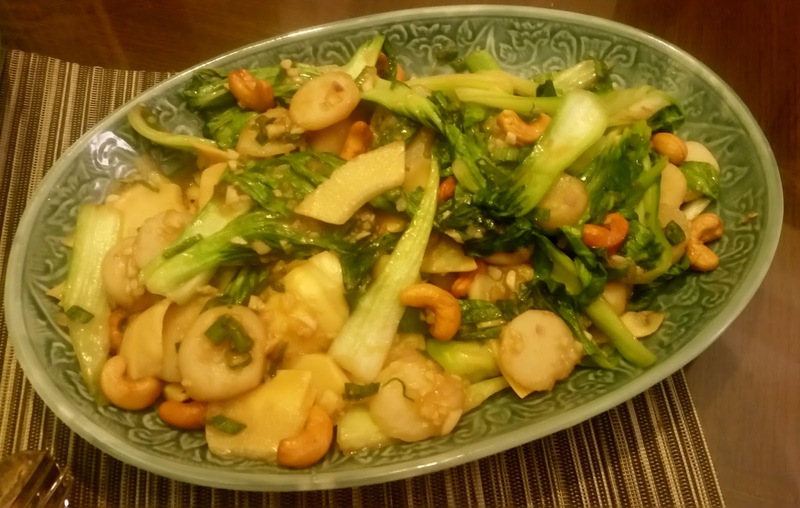 A vegetarian dish, Phaaw Saeht had stir fried water chestnuts and bok choy, in a nice combination, I enjoyed it with the Pad Thai. In the dessert section, I liked the Coconut Ice Cream with Dates Cigar. There was also Thap Thim Krawp, iced coconut milk with water chestnut. 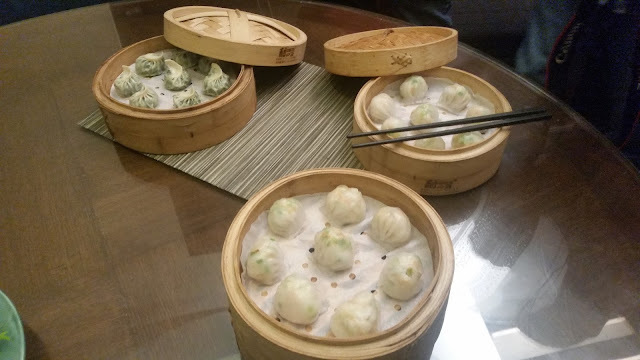 I liked that the special menu was curated very thoughtfully – it had dishes of differing tastes as well as dishes from different geographies of the orient. 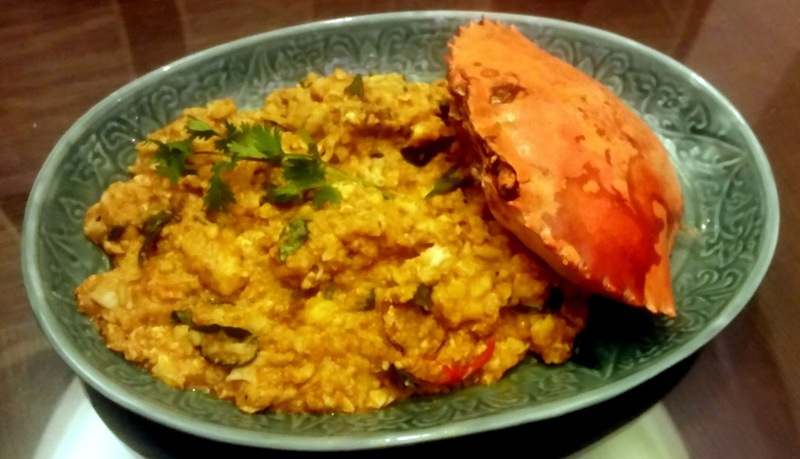 I have always been a fan of Chef Taraknath’s preparations ever since I first tried them out a couple of years back. 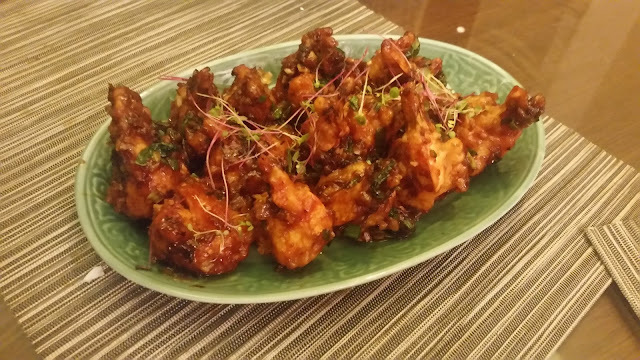 Mekong definitely ranks among the top restaurants serving oriental food in Hyderabad, and it is good to see that they maintain the consistency in their offerings.